Makeup removers, along with removing the last trace of makeup from your skin, also keep your skin clear and free from breakouts. Go the safe and preferred way with the revlon eye and lip makeup remover that is opthamologist tested and found safe to use on the eye and lip contour region. 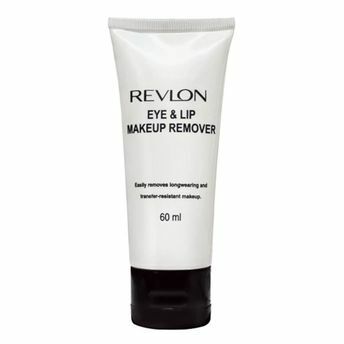 You don?t have to struggle hard to remove waterproof or long wear makeup with this revlon makeup remover anymore. The unique formulation is designed to gently but effectively wipe off stubborn makeup from the surface of your skin. The creamy formula easily glides over your skin to thoroughly remove even the smallest trace of makeup and chemicals. Ideal for women who use makeup, this revlon makeup remover also prevents breakouts as it keeps your pores free from makeup. Your skin instantly feels soft and free from any harmful residues. Just slip the handy revlon makeup remover tube into your bag of toiletries or your travel bag and flaunt natural skin that is soft and clean after getting back from that beach party. Explore the entire range of Eye Makeup Remover available on Nykaa. Shop more Revlon products here.You can browse through the complete world of Revlon Eye Makeup Remover .